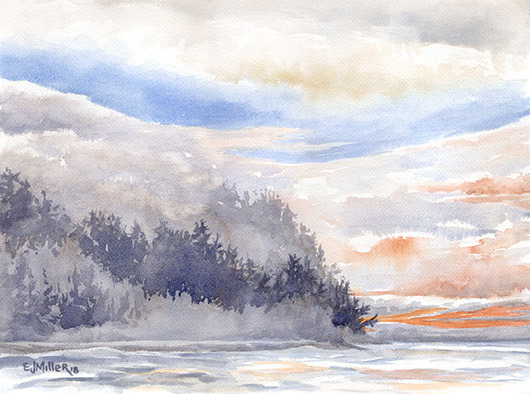 Sunset at Tillamook Head, plein air watercolor ©2018. On view at the OSA Gallery April 9 – 24. This spring I’ve been out with my easel, plein air painting in Oregon and Kauai. I started on the Oregon coast, where I captured a cold, wet, and brilliant sunset over Tillamook Head in Seaside. It had been foggy and dark all day, but a break in the clouds at sunset let through stripes of pink, orange and gold. This painting is one of three I have on view at the Oregon Society of Artists group show in Portland. Last year I missed painting the cherry blossoms here in Oregon, and I’ve been looking forward to this spring ever since. I set up at the Portland waterfront near the Steel Bridge, just as an afternoon rainstorm was clearing. I’ve been challenging myself to work bigger and looser. I’m comfortable doing a tight, detailed 8×10″ plein air painting in under two hours, so instead I’ve been working on 12×16″ paper and giving myself the same amount of time! 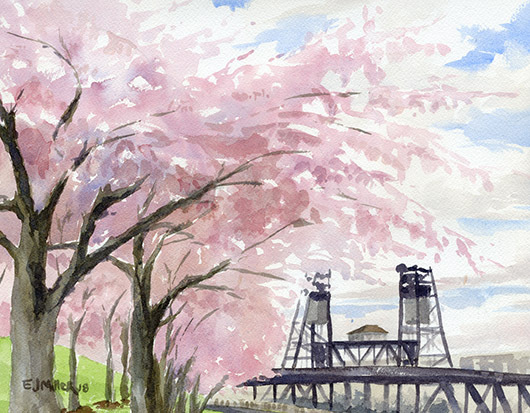 Cherry Blossoms at Portland Waterfront, plein air watercolor ©2018. 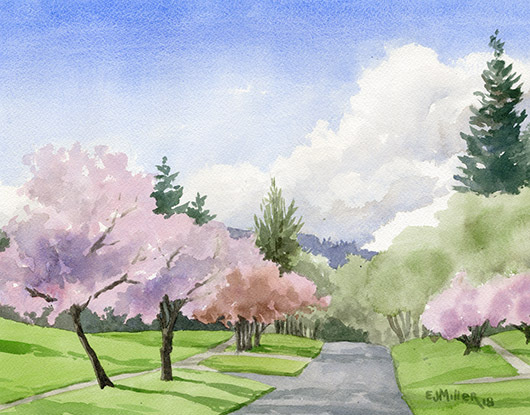 Cherry Blossom Road, plein air watercolor ©2018. I arrived on Kauai in the middle of a solid month of dark, overcast “Oregon” weather. I’ve always loved stormy skies, so I got out and painted as much as I could, finding new perspectives on some of my favorite spots from Mahaulepu to Hanalei. Gillin’s Beach, Mahaulepu, plein air watercolor ©2018. I lived in Lihue for twelve years, so the Ha’upu mountain range holds a special place in my heart. It’s the mountain you fly past just before landing at Lihue Airport, and the same mountain seen from the other side at Mahaulepu, Poipu and Koloa. The range is close enough to Lihue that shifting clouds create a constantly changing composition of flat silhouettes and sharply defined ridges. 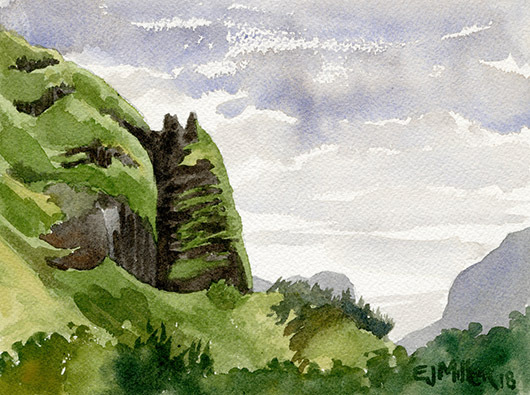 Haupu from Niumalu, plein air watercolor ©2018. “Niumalu Banana Patch” was a new type of plein air painting for me. I typically complete an entire painting in a single two-hour session. But I had a perfect view of this complicated banana patch from my bedroom window, so I took my time and spent three entire mornings on the painting: one for the detailed sketch, one for blocking in color, and one final morning for all the detail. 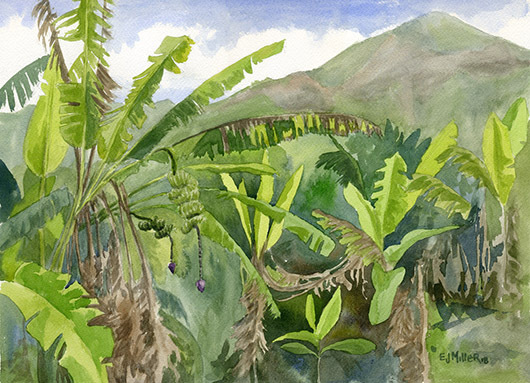 Niumalu Banana Patch, plein air watercolor ©2018. 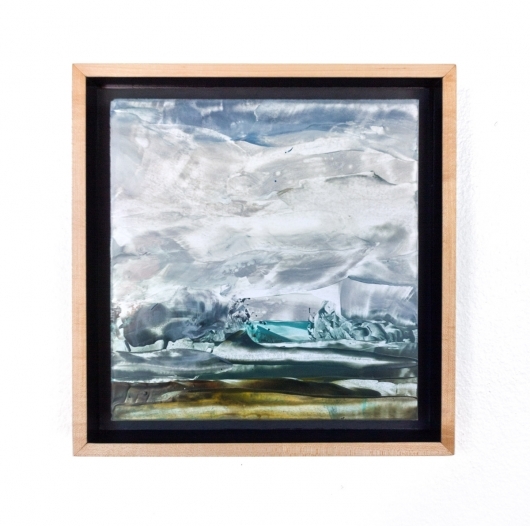 Here are the other two paintings I’m exhibiting in the Water, Weather, Wind and Rain group show. I hope to see you there! Left: Rain over Marshlands (Cascadia Winter series), encaustic ©2016. 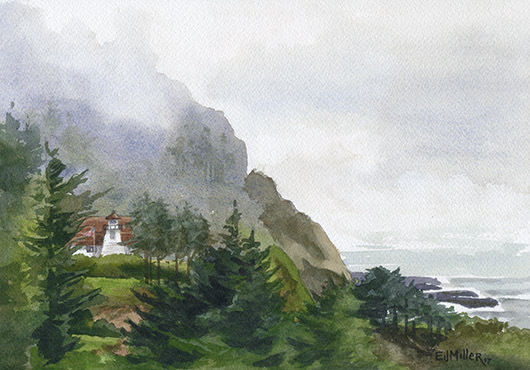 Right: Cleft of the Rock Lighthouse (Oregon Lighthouses series), watercolor ©2017. Dear Emily: Many many thanks for your latest blogs and for the miniature copies of your latest paintings. We especially admire the cherry-blossom ones. Your blogs are an event for us.